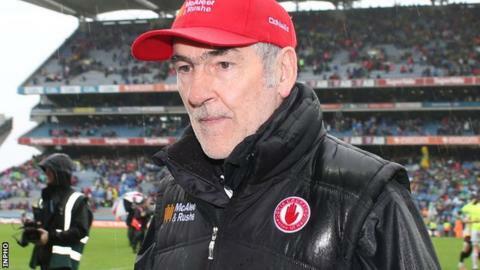 Tyrone club delegates are to meet with the county executive on Tuesday evening to decide on the future of senior team manager Mickey Harte. Harte has had talks with a three-person delegation from the executive, headed by county chairperson Roisin Jordan. Their recommendation will be considered by the rest of the executive and club officials at the meeting in Garvaghey. Harte's position has been uncertain since the Red Hands made their exit from the All-Ireland Championship. Tyrone were the last remaining Ulster county in the competition before losing out to Kerry in the semi-finals. For the first time since his appointment in late 2002, Harte does not have an agreed extension to his term. But he has made it clear that he wants to continue for a 14th season. Three days after the defeat by Kerry, he held a meeting with the players to review the season and discuss plans for 2016. And he has been on the look-out for fresh talent over the past two weekends, when he attended a number of club championship games. The county executive has not yet met with the Under-21 management, but are expected to sit down with the All-Ireland winning team of Feargal Logan, Brian Dooher and Peter Canavan within the next week. Nominations have closed for candidates for the post of minor manager, following Mickey Donnelly's departure after five years in the job.